What keeps the lights on at Writing Between Pauses? I take sponsored posts and affiliate programs that I think would be beneficial to my readers (you can check out my PR page here and read my disclosure policy here). Want to treat yourself a little bit? Check out my affiliates here! By using an affiliate link or code, I receive a small amount of compensation--just like your favorite YouTube Beauty Gurus and those Morphe codes! WRITINGBETWEENPAUSES10 at checkout for 10% off your order! I love the Beauty Crop's all natural products. Their PB&J Smoothie Sticks are so luxurious feeling. You can read my entire review of the Beauty Crop here. 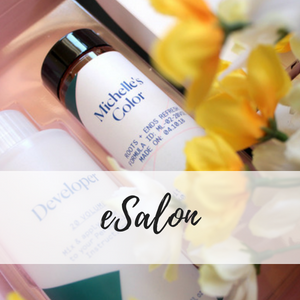 Click the image above to try eSalon and receive a small discount to your first order! eSalon really won my heart after a not-so-great experience (read about that here); you can read my turnaround post here. WRITINGBETWEENPAUSES15 at checkout for 15% off your order. (Click the image above to use my affiliate link as well!) Smile Brilliant is one of the best whitening systems I've ever used. Read my full review here.